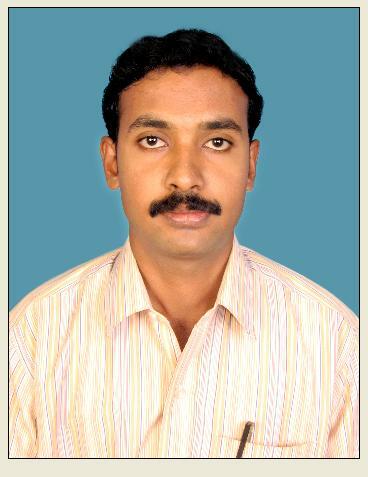 Mr. P. Rajarajan obtained his graduation degree in Physics from National College, Tiruchirappalli in the year 2003. Currently he is pursuing his reseach in the field of Laser Materials Processing under the supervision of Prof. D. Sastikumar. Singapore for attent Laser Metrology conference during 30th June to 2 nd July 2008. 1. President, NITT-SPIE Student Chapter. The International Society for Optical Engineering (SPIE), USA. 2. Member of Optical Society of America (OSA). USA. Viswanathan, A.; Sastikumar, D.; Rajarajan, P.; Kumar, Harish; Nath, A. K. “Laser irradiation of AISI 316L stainless steel coated with Si3N4 and Ti”, Optics and Laser Technology, v. 39, iss. 8, p. 1504-1513. 1. P. Rajarajan, A.Viswanathan, D.Sastikumar, M. Jamal Mohamed Jaffar and A.K.Nath, “Laser Surface modification of AISI 316L stainless steel with Si3N4 and Ti” Souvenir of International Conference on Optics and Optoelectronics (ICOL-2005), Organised by the IRDE, Dehradun, Uttaranchal, India, Dec. 12-15, 2005, PP.422. 2. G.Gobi, D.Sastikumar, P.Rajarajan and M. Jamal Mohamed Jaffar, “Fiber optic sensor incorporated liquid layer thickness estimator” Souvenir of International Conference on Optics and Optoelectronics (ICOL-2005), Organised by the IRDE, Dehradun, Uttaranchal, India, Dec. 12-15, 2005, PP.147. 1. A.Viswanathan, D. Sastikumar, P.Rajarajan, M.J. M. Jaffar, and A.K.Nath, “Laser embedment of Fe-Cr Layer on Al-12Si alloy” Proceeding of the National Seminar on Laser in Technological and Bio-Medical applications (NATBI-2005), St. Joseph’s College, Tiruchirappalli. January 27-28, 2005. PP. 36-37. 2. G.Gobi, D.Sastikumar, P.Rajarajan and M. Jamal Mohamed Jaffar, “Reflectivity Based FODS Incorporated Thin Film Thickness Evaluator” Proceeding of Fifth DAE-BRNS National Laser Symposium (NLS-5), VIT, Vellore, India. 7-10, December 2005. PP 294-295. 3. A.Viswanathan, D.Sastikumar, M. Jamal Mohamed Jaffar, P. Rajarajan, Harish Kumar, R.Kaul and A.K.Nath, “Metal Matrix Composite reinforcement on an Al-Si alloy by Laser Processing” Proceeding of Fifth DAE-BRNS National Laser Symposium (NLS-5), VIT, Vellore, India. 7-10, December 2005. PP. 286-287. 4. P. Rajarajan, D.Sastikumar, M. Jamal Mohamed Jaffar, A.Viswanathan Harish Kumar, R. Kaul and A.K.Nath, “Laser assisted surface layer formation on AISI 304 SS with preplaced Si3N4–Zr–Ni” Proceeding of Fifth DAE-BRNS National Laser Symposium (NLS-5), VIT, Vellore, India. 7-10, December 2005. PP. 332-333. 5. M.Jamal Mohamed Jaffar, D.Sastikumar, P.Rajarajan and A.K.Nath, “ Laser aided Al-Si-WC composite layer formation on an Al-Si substrate” Proceedings of National Conference on Application Oriented Materials (NCAOM–2006), SRM Institute of Science and Technology, Kattankulathur, Tamilnadu, India. March, 2006. PP. 130-132. 6. P. Rajarajan, D.Sastikumar, M. Jamal Mohamed Jaffar, Harish Kumar and A.K.Nath, “Characterization of Laser alloyed WC-Zr-Ni coating on AISI 304 SS” Proceeding of sixth DAE-BRNS National Laser Symposium (NLS-6), RRCAT, Indore, M.P, India. 5-8, December, 2006. PP. 449-450. 7. M. Jamal Mohamed Jaffar, P. Rajarajan, D.Sastikumar, Harish Kumar and A.K.Nath, “Laser assisted stratified alloying of Al-Si alloy with Fe-Cr-Si” Proceeding of sixth DAE-BRNS National Laser Symposium (NLS-6), RRCAT, Indore, M.P, India. 5-8, December, 2006. PP. 447-448. 8. M. Jamal Mohamed Jaffar, P. Rajarajan, D.Sastikumar, Harish Kumar and A.K.Nath, “Laser processed composite layer with in-situ synthesized TiC-SiC reinforcement” Proceeding of sixth DAE-BRNS National Laser Symposium (NLS-6), RRCAT, Indore, M.P, India. 5-8, December, 2006. PP. 337-338.
ïƒ˜ Two day Workshop on Optics and Photonics (WOOP – 2005), at National Institute of Technology, Tiruchirappalli on August 18 – 19, 2005.
ïƒ˜ One Day Workshop on Communication Skills, on 1st December 2006.
ïƒ˜ Two day Workshop in “Research Orientation Program for Entrants (ROPE-2007)”, at National Institute of Technology, Tiruchirappalli on August 8 – 9, 2007. * Summer Training Program in Physics (STPIP’ 2002), Conducted by Department of Nuclear Physics, MADRAS UNIVERSITY during June 3 – 21, 2002. * Awareness Program on Applications of Radioisotopes and Radiation Technology for Societal Development (ARRTS – 2004), at Anna University, Chennai during July 13 – 14, 2004. College, Tiruchirappalli on August 28, 2004. * UGC Sponsored State Level Seminar on “Recent Advances in Thin film Technology”, at Jamal Mohamed College, Tiruchirappalli on September 28, 2005. * One day course in “Laser Material Processing” conducted by Indian Laser Association at VIT, Vellore, India on 6th December, 2005. * International Conference on Optics and Optoelectronics (ICOL-2005), Organised by the IRDE, Dehradun, Uttaranchal, India, Dec. 12-15, 2005. * National Conference on Application Oriented Materials (NCAOM–2006), SRM Institute of Science and Technology, Kattankulathur, Tamilnadu, India. March, 2006. * Two day Workshop on Thin Film Technology (WOTT – 2006), at National Institute of Technology, Tiruchirappalli during March 24 – 25, 2007. * Sixth DAE-BRNS National Laser Symposium (NLS-6), RRCAT, Indore, M.P, India. During 5-8, December, 2006. * Two day Workshop on Laser Materials Processing (LAMP – 2007), at National Institute of Technology, Tiruchirappalli during January 10 – 11, 2007. * Two day workshop on “Emerging Trends in Corrosion Control and Surface Engineering” (CC&SE 2007), at National Institute of Technology, Tiruchirappalli during February 9-10, 2007. * One day Seminar in Surface Engineering - Challenge-2007 on 21st November 2007, at National Institute of Technology, Tiruchirappalli. * National Seminar on Sensor and its Applications (NSSA – 2007) at National Institute of Technology, Tiruchirappalli, during December 7-8 2007. 1. Treasurer, NITT-SPIE Student Chapter. The International Society for Optical Engineering (SPIE), USA. 2. Treasurer, NITT-OSA Student Chapter. Optical Society of America (OSA). USA. 3. Member of Indian Laser Association (ILA), India.